Heat, stirring constantly, until ball forms. Knead. Store in airtight container or plastic bag. Makes about 4 portions. For children who can’t tolerate gluten or food coloring, substitute rice flour for white flour and natural beet (red), spinach (green) or carrot (orange) juice for color. Large batch is perfect for your Halloween party! Mix all of the ingredients together. Cook and stir over medium heat until dough forms. Knead dough until smooth. 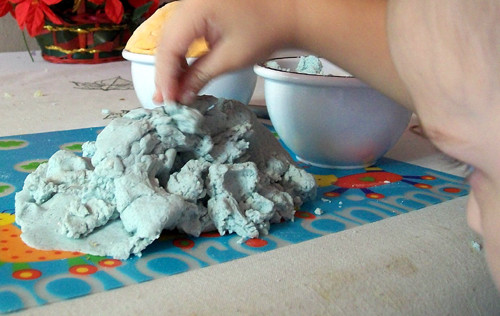 These yummy edible clay recipes can be enjoyed as snack food after the creating is done! Mix equal parts peanut butter and dry milk. Slowly add honey to desired consistency. If too sticky, add more dry milk. If too dry, add more honey. Form clay into shapes or roll into balls to be served as cookies. Combine all ingredients and you are ready to play! The secret of pastry chefs for making tasty cake decorations! Basic play clay makes a great party favor too! Put a portion of clay in a plastic sealable bag along with a label with the party guest’s name, decorated with markers or stickers. Add a colorful cookie cutter or cut a 1/2 inch dowel into 4 inch lengths to serve as a little dough roller.